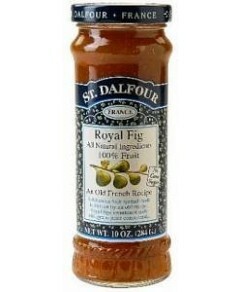 Want to add an exciting spin to your breakfast routine? 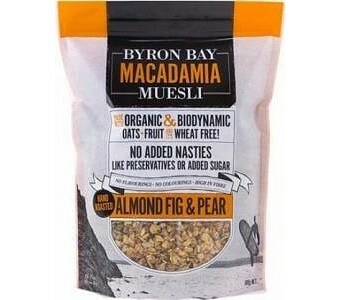 Then Byron Bay Macadamia Muesli Almond Fig & Pear will definitely start your day off on the right track. Enjoy every spoonful of Almond Fig & Pear as it’s made with delicious macadamia honey roasted muesli that is simply irresistible, while reaping the health benefits of Australian figs and pears that are a rich source of monounsaturates, antioxidants, vitamins and minerals. No cholesterol Low in saturated fat and sodium No added preservatives No added sugar Wheat free Ingredients: Organic Australian oats, organic sunflower kernels, pumpkin seeds, sesame seeds, insecticide free almonds, organic figs, organic raisins, biodynamic dehumidified pears, spray free macadamia nuts, macadamia honey & cold pressed macadamia oil.